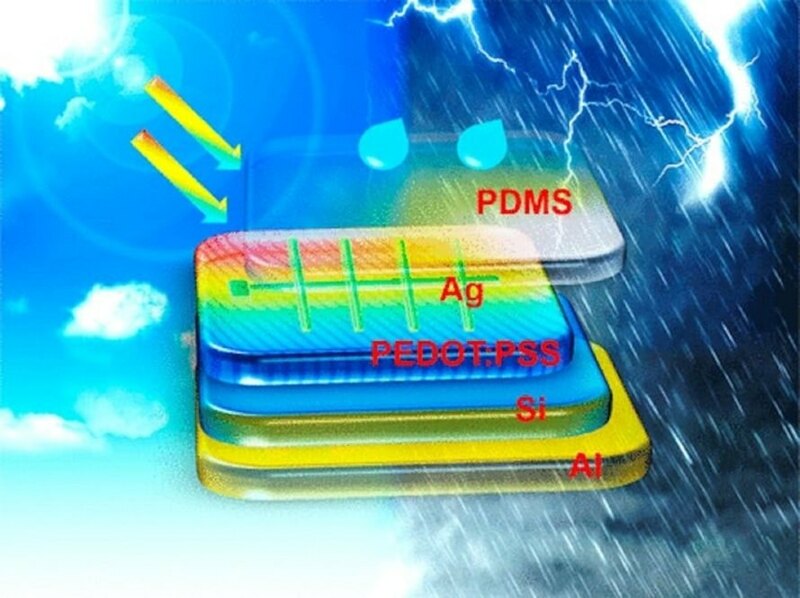 A team of Chinese engineers have created a new hybrid solar panel that can also harvest energy from raindrops. This new technology takes advantage of the triboelectric effect, wherein certain materials exhibit an electrical charge after coming into contact with a different material. Triboelectric nanogenerators (TENGs) deliberately create this charge through friction – and they may someday be used to harvest static electricity from clothing, car wheels, or touch screens. For the moment, TENGs are successfully being used to capture the latent energy of raindrops. To create a TENG, the team added two transparent polymer layers on top of their solar panel. The upper layer polymer is made from polydimethylsiloxane (PDMS) while the lower layer is composed of poly(3,4-ethylenedioxythiophene):poly(styrenesulfonate) (PEDOT:PSS). To increase the TENG’s efficiency, the polymer layers were imprinted with grooves modeled on the data side pattern of DVDs. When raindrops fall, they push the top layer into contact with the lower layer, which then acts as an electrode between the TENG and the solar panel. Although the resulting electricity produced by the TENG-enhanced panel is relatively small, it nonetheless proves that such a device works and could be scaled up with further research. While this is not the first instance in which a TENG has been incorporated into a solar panel, the team describes their device as simpler, more streamlined and easier to manufacture than previous models. Theirs emphasizes the abundance of energy that exists all around us, which only needs to be harnessed to step closer towards a true clean energy economy. The newly engineered hybrid solar panel uses the generation of electricity through friction to enable the panel to capture energy from raindrops. An artist's depiction of the layering involved in enabling the solar panel to capture energy from rain.